Doctor Strange Rumor Suggests He's in Guardians of the Galaxy 2 | Nerd Much? A new Doctor Strange rumor seems to suggest his appearance in the upcoming Guardians of the Galaxy 2. Seems like the Doctor is getting around. According to Collider Movie Talk, there are rumors that Doctor Strange could possibly make an appearance in Guardians of the Galaxy 2. Additionally, he could show up in a post-credit scene. While we don’t much more information than that, Strange’s presence wouldn’t feel that out of place. We already know that the character will be appearing in Thor: Ragnarok, another space-heavy movie. Director James Gunn has been fairly adamant that Guardians of the Galaxy 2 won’t feature any of the Avengers, but Doctor Strange technically isn’t even a member. Still, we think the likely case is that the Doctor Strange rumor refers to the post-credit scenes. After all, Marvel needs to tease the next Thor movie, don’t they? Guardians of the Galaxy 2 is slated for a May 5th release date. 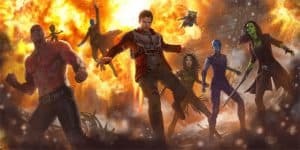 We already know the film will star Chris Pratt, Zoe Saldana, Dave Bautista, Karen Gillan, Bradley Cooper, Vin Diesel, Michael Rooker, and Sean Gunn. That’s a huge ensemble for one movie, and that’s not even mentioning any of the new cast. I’m sure could squeeze a doctor in somewhere.